A recent discovery of a new rock-dwelling gecko species became rocking news in the environment field. The new species found in a unique habitat in the Rammalakanda Forest in the Hambantota district is scientifically known as 'Cnemaspis rammalensis'. According to the research team leader expert herpetologist Mendis Wickramasinghe, this newly found gecko is the largest so far reported from its genus in Sri Lanka and the second largest found in the Western Ghats ( India) - Sri Lanka biodiversity region. Sri Lanka and Western Ghats region in India are considered as biodiversity hotspots. The new gecko is named as 'Rammale diva huna', 'Rammale pahalpalli' and 'Rammale day gecko' in Sinhala, Tamil and in English. Geckos in the genus 'Cnemaspis' are characterised by a diminutive, slender body, large forward and upwardly directed eyes with round pupils, and elongate slender digits bent at an angle with entire subdigital lamellae. These cryptically coloured geckos select specific small areas as their habitats and come out during the day time. As Wickramasinghe described this rock dwelling gecko is a cave and crevice dweller, and can only be found within well-shaded caves, on rock surfaces and inside rock crevices. "It was found to inhabit only the primary rain forest in its type locality and was not observed in the adjacent secondary forest or well-wooded home gardens, and was not seen in association with trees," he said. As researchers said, such a large species living in a small forest patch at the edge of the wet zone was unexpected. "The new species can easily be identified from the others by the presence of a unique, prominent, black bar at the nape," Wickramasinghe said. The research team headed by Wickramasinghe includes Dulanga Widanapathirana, Nethu Wickramasinghe of the Herpetological Foundation of Sri Lanka and Gehan Rajeev of the Centre for Applied Biodiversity Research and Education. 'Cnemaspis' is a genus of diurnal geckos found in Asia. With around 75 species, it is one of the most diverse genera of geckos or even lizards. Specimens are deposited in the National Museum of Sri Lanka and the Department of National Wildlife Research and Training Centre, Girithale. 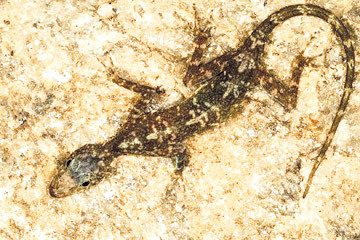 The particular spot where this new gecko was discovered, the Rammalakanda Forest Reserve is located in the border between Hambantota and Matara districts which spreads over 1,700 hectares in extent, and over 400 hectares of this had been declared as a Man and Biosphere Reserve by the Forest Department. Geographically the Reserve is situated in the southeast end of the wet zone. Rammalakanda is an elongated hill range approximately 10 km in length and reaching about 700 metres. Rammalakanda has been recognised as one of the 70 top priority forests in terms of watershed protection and the faunal and floral diversity, by the National Conservation Review. "Today tea plantations and human settlements in the surrounding areas are slowly expanding, and are encroaching towards the forest. It is slowly destroying the habitat of this species," Wickramasinghe said. Geckos are considered to be the most primitive living saurian in Sri Lanka. According to research done in 1877 there have been a record sixteen species of geckos and this is mentioned in the book 'Reptile Fauna of Ceylon' by Ferguson. This is supposed to be the first comprehensive and fully annotated list of the Sri Lankan herpetofauna. Subsequently leading researchers such as Deraniyagala and Taylor have described 15 species in eight genera and 20 species in eight genera, respectively. Again in 1953, Deraniyagala increased the number of species and subspecies to 19 in the volume II of the Colored atlas of vertebrates of Ceylon. In recent findings by researchers such as Manamendra-Arachchi it was considered the Sri Lankan gecko wealth to be 19 living forms and after several additions Anslem de Silva in 2006 lists 25 taxa (groups) in his checklist. With the description of several new 'Cnemaspis' species in 2007 before 'Cnemaspis rammalensis' the total number now has risen to 42, according to herpetologists.